For a traditional Christmas bulb shape, but with an added flair of faceted lenses, our C9 LED bulbs are a great choice for many lighting needs. 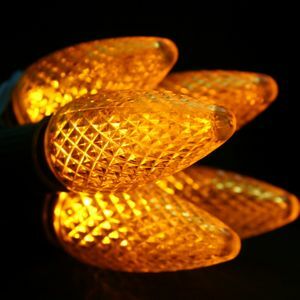 These golden C9 LED bulbs are energy efficient and have little heat output. Use them in large quantities both indoors and outdoors. The rich, warm glow of yellow C9 bulbs will bring lighting drama to many year 'round events. This color is ideal for golden anniversary parties, retirement celebrations and weddings. Consider using them in your fall events, such as carnivals, Halloween parties and neighborhood block parties. Each multi-faceted bulb is just over 3 inches in length and comes in bags of 25 each. When placed in your cord, purchased separately, they will add drama and warmth to your celebrations. Be sure to check out our many varieties of hardware to make installing your indoor and outdoor Christmas lights much easier. Note for Operation: This bulb is for static displays only. The animation will instantly damage this bulb - "pop it". This item cannot be dimmed. Virtually unbreakable, colors will not fade or peel. Bulbs use up to 98% less electricity while remaining cool to the touch. Retro-Fit, Faceted. 5 LEDs per Bulb.